What’s Wrong With the American Health-Care System? A recent chart based upon statistics from the international Organisation for Economic Co-operation and Development (OECD) dramatically illustrates what is wrong with the American health-care system. 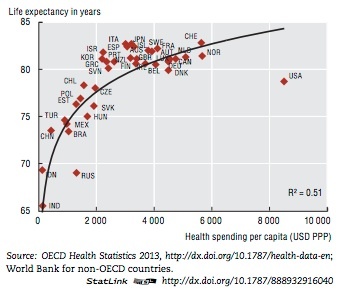 The chart graphs the correlation between life expectancy and per capita health care expenditures for most major nations. Not unexpectedly, the chart shows that there is a strong relationship between health-care spending and life expectancy. However, the chart also shows that the United States spends much more on health care (approximately $8,500 per person per year) than our closest competitors Norway and Switzerland (approximately $5,500 per person per year). And yet the United States has one of the lowest life expectancies of any developed country. People live longer in almost every country in Europe. While life expectancy may not be the best measure of the quality of a health-care system, what the chart does illustrate is that we are spending much more on health care than any other developed nation. Why? According to a Bloomberg ranking, the United States ranks 46th among 48 developed nations in health-care efficiency, below China, Iran and Columbia. But why is our system so inefficient? Largely because it is built for profit. Unlike almost all other developed nations, our government has historically had little or no role in either providing health care or setting prices. Therefore, costs continue to increase, while the quality of care suffers. This is shameful, and responsible legislators would be trying to do something about it.